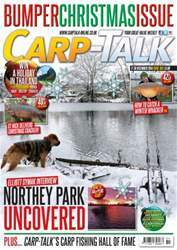 This week’s bumper Christmas issue of Carp-Talk (issue 1051) is available to download now. 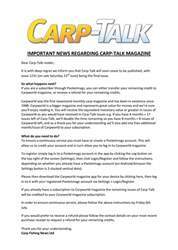 The Carp-Talk Awards nominees are unveiled, and four names are inducted into the Carp Fishing Hall of Fame. 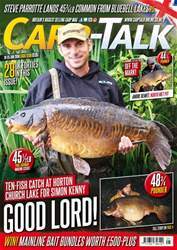 Kev Hewitt looks back on a tremendous year on Bluebell Swan Lake, and we find out more about two-time UK Carp Cup winner, Kev Grout. In an exclusive interview, we talk to Elliott Symak about his amazing syndicate water, Northey Park, home to the 50lb-plus Kitch. Mat Woods visits one of the most exciting day-ticket waters in the UK, the Monument 2, and Adam Penning explains his multi rig. 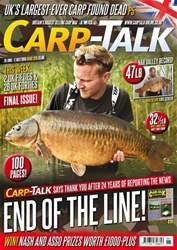 We look at the facts and figures from catches in Carp-Talk in 2014, Mark Pitchers talks about the filming his popular YouTube series, The Challenge, and Kai Richards reviews a successful year. 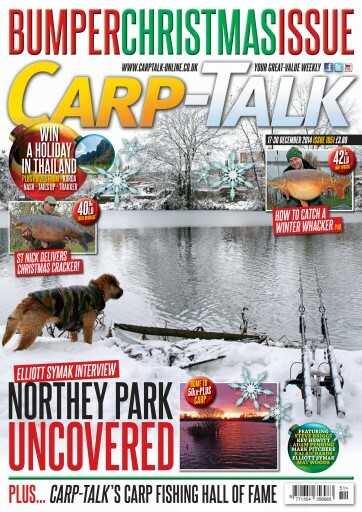 Steve Briggs visits Armfield Angling’s Lac de Villedon, Adam Clewer is in ‘A-Z’, and the Venture Razor-Duo Bivvy System goes under the spotlight in ‘Trade Talk’. In a plethora of competitions, we have £270 of Tails Up Wangers, a luxury fishing holiday in Thailand, £180 of Nash alarms, £260-plus of Trakker clothing and £380-plus of Korda Heli products to give away.